through the pulmonary capillary bed. In doing this, the lungs expose a large area of tissue, which can be damaged by dusts, gases and infective agents. Nasal symptoms are extremely common and both common colds and allergic rhinitis cause ‘runny nose’(rhinorrhoea), nasal blockage and attacks of sneezing. In allergic rhinitis, symptoms may be intermittent, following contact with pollens or animal danders, or persistent, especially when house-dust mite is the allergen. Cough is the most frequent symptom of respiratory disease. It is caused by stimulation of sensory nerves in the mucosa of the pharynx, larynx, trachea and bronchi. Acute sensitisation of the normal cough reflex occurs in a number of conditions, and it is typically induced by changes in air temperature or exposure to irritants such as cigarette smoke or perfumes. Afferent receptors go to the cough centre in the medulla where efferent signals are generated to the expiratory musculature. A worsening cough is the most common presenting symptom of lung cancer. The explosive quality of a normal cough is lost in patients with respiratory muscle paralysis or vocal cord palsy. Paralysis of a single vocal cord gives rise to a prolonged, low-pitched, inefficient ‘bovine’ cough accompanied by hoarseness. Coexistence of an inspiratory noise (stridor) indicates partial obstruction of a major airway (e.g. laryngeal oedema, tracheal tumour, scarring, compression or inhaled foreign body) and requires urgent investigation and treatment. 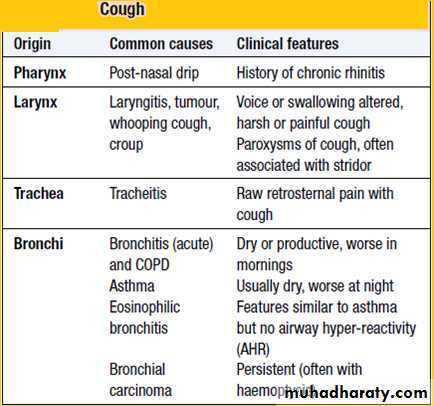 The characteristics of cough originating at various levels of the respiratory tract are detailed in the Box below.  The commonest cause of mild haemoptysis is acute infection, particularly in exacerbations of chronic obstructive pulmonary disease (COPD) but it should not be attributed to this without investigation.  Other common causes are pulmonary infarction, bronchial carcinoma and tuberculosis.  In lobar pneumonia, the sputum is usually rusty in appearance rather than frankly blood-stained.  Pink, frothy sputum is seen in pulmonary oedema. 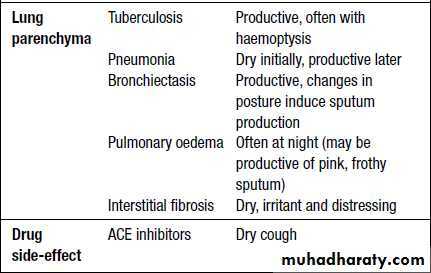  In bronchiectasis, the blood is often mixed with purulent sputum. 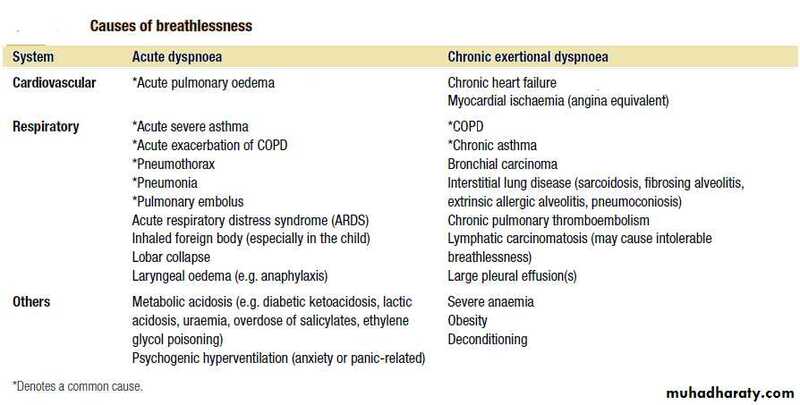  Massive haemoptyses (>200 mL of blood in 24 hours) are usually due to bronchiectasis or tuberculosis.  Uncommon causes of haemoptyses are idiopathic pulmonary haemosiderosis, Goodpasture’s syndrome, microscopic polyangiitis, trauma, blood disorders and benign tumours. from an exacerbation of allergic bronchopulmonary aspergillosis. Sometimes such sputum looks like casts of inflamed bronchi. Breathlessness should be assessed in relation to the patient’s lifestyle. For example, a moderate degree of breathlessness will be totally disabling if the patient has to climb many flights of stairs to reach home. 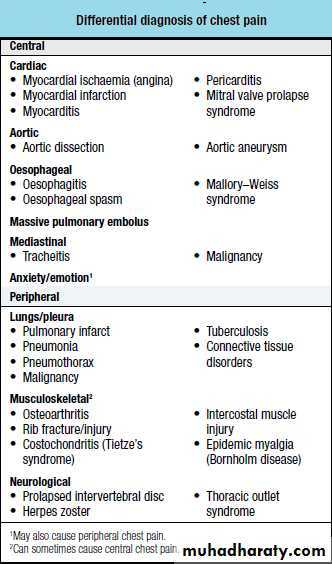 The most common type of chest pain reported in respiratory disease is a localized sharp pain, often termed pleuritic. It is made worse by deep breathing or coughing and the patient can usually localize it. Localized anterior chest pain with tenderness of a costochondral junction is caused by costochondritis. Shoulder tip pain suggests irritation of the diaphragmatic pleura, while central chest pain radiating to the neck and arms is likely to be cardiac. Retrosternal soreness is associated with tracheitis, while malignant invasion of the chest wall causes a constant, severe, dull pain.